Recently my Garmin Edge 800 stopped being reliable. It turned itself off whenever it felt like it; most of the time when I was really relying on it. I had run out of open source maps, and was told that it would cost in excess of $150 to have the Garmin looked at. I’d had enough. As soon as I arrived in South Korea I purchased a smartphone for navigational purposes. As it turns out this was the best gear swap-out I’d made in a long while – smartphones make navigation a pleasure because they are so user friendly. I can immediately download detailed maps which are easy to move, zoom in and out of, and create points of interest in. Not only is the device more usable, but the GPS chip in my iPhone 5S is faster and more accurate than my Garmin. CyclingAbout Epiphany: Smartphones are the perfect navigation tool for bicycle travel. But hold on a minute, it’s hard to ride and navigate with only one hand. How would I make the smartphone easy to access while riding? 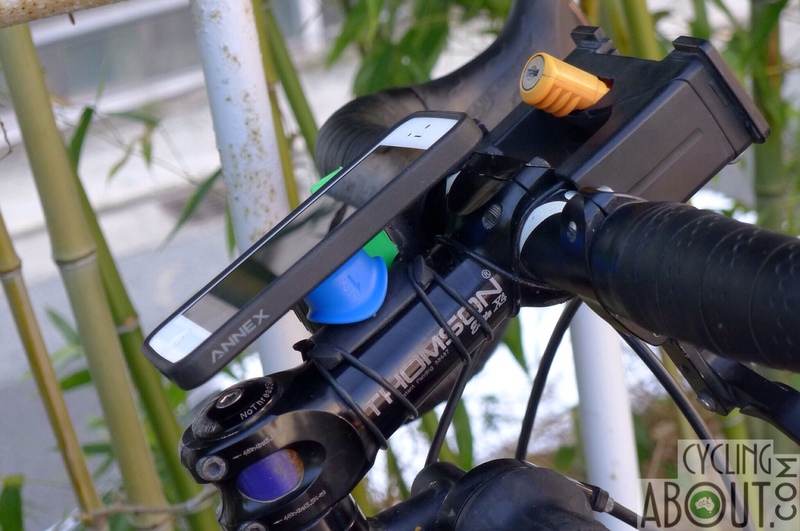 How would we wrangle it so that the phone is easy to take on and off the bike? Quad Lock is the answer. What is a Quad Lock? Quad Lock started out on Kickstarter a couple of years ago and, and like any good idea on crowdfunding websites, it made tonnes of money and went into production. The Quad Lock system is comprised of two parts: a mount (bike mount) and an adapter (iPhone case). There are a number of different ways you can use the Quad Lock products, but the most useful for me is to connect my iPhone directly to the bike. To attach my iPhone, I angle the phone at 45 degrees and push it down with one hand. The spring-loaded bike mount allows the phone to engage and when I twist the phone straight, it locks into place with a firm ‘click’. Once connected, the phone isn’t going anywhere… unless of course you want to take it off. Disengaging it requires two hands, one to push the blue tube away from the phone and the other to slide the phone to 45 degrees again to take it off. With a bit of practice you can actually do this manoeuvre with one hand! Why is the Quad Lock Awesome? The Quad Lock is secure. We have cycled some incredibly rough roads on our tandem bicycle (at speeds up to 100km/h) and have never felt like our smartphone was at risk. The Quad Lock is fast. Within a second our iPhone is on and off our bike. The Quad Lock is slim. Our smartphone case is only 4.5mm thicker than if we had a standard case. We’ve never felt like it is cumbersome in our pockets. The Quad Lock is universal. Bike mounts, car mounts, tripod adapters, belt clips, arm bands, heart rate monitors – the Quad Lock will fit on it all. If you need to mount a device onto something they don’t make, try the adhesive mounts. I put a waterproof poncho on my phone. Seriously. That said, smartphones are nigh on impossible to use with water on the screen. In my experience, touch screens are far too sensitive to use in the rain, even with a waterproof cover. I normally have to wipe down the screen on my clothing in order to make it properly usable. So the Quad Lock poncho makes rainy navigation possible… kinda. What Smartphone Cases are Available? Currently, Quad Lock smartphone cases are available for the iPhone 4/4S/5/5S/5C/6 and Samsung Galaxy S4/S5. But, if you use a different phone/phablet/tablet/device, don’t stress. Quad Lock have you covered with a universal adhesive mount. What is the price of the Quad Lock and where can you get one? You can purchase Quad Lock gear from their online store. 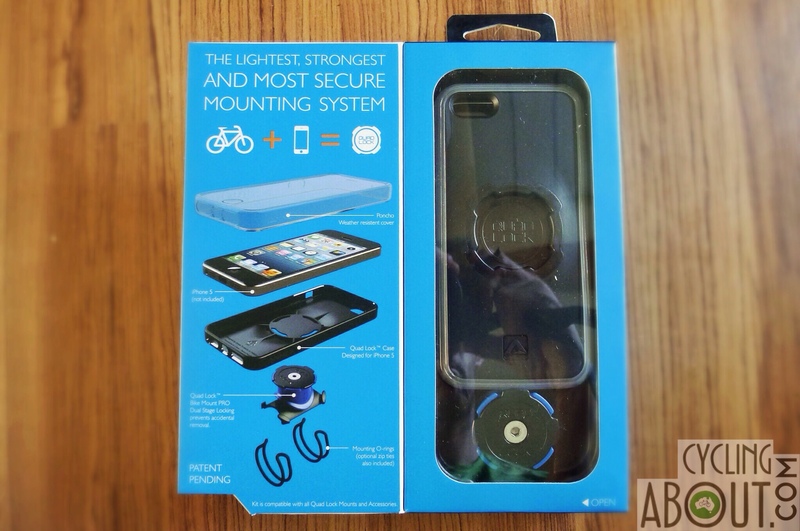 Expect to pay $69.95 USD for a smartphone case and bike mount with free postage worldwide. If you don’t need the case, the universal kit is just $39.95 with free postage worldwide. Definitely! It is hard to give something a near perfect score, but in the case of the Quad Lock, perfection has nearly been achieved. As mentioned above, the only issue I’ve found is that even with the waterproof poncho, the iPhone is too sensitive to be properly usable. When it rains, I simply put my phone away. 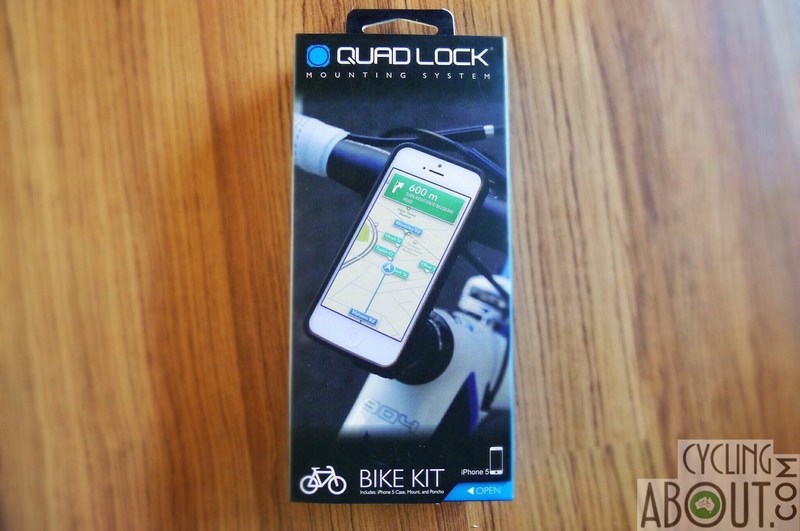 If you’re using a smartphone for navigation, the Quad Lock mounting system is a superb option. Is MapOut The Best Smartphone Mapping App For Route Drawing and Elevation?